Ginger Belle, a Yorkshire terrier from South Carolina, ran away in early May, 2014. Her distraught owners searched for her all over town but were unable to find her. Thankfully not too long after, Ginger Belle was picked up and brought to a local store where she was scanned for a microchip. Although she was collarless, it's because of Ginger Belle's microchip that she was identified and reunited with her family. Like Ginger Belle, many pets have benefited from being microchipped; yet there are many owners hesitant to do the same. If you're still unsure, here are some reasons why you should consider it. Depending on the veterinarian, for $25-$50 you can have your pet microchipped. The implant is only the size of a grain of rice, but contains a special ID number that is linked to your contact information. The one time fee includes the implantation, and the registration in a pet recovery database where your contact information is stored. This information should be updated every time you move or change your phone number. The microchip procedure doesn't require any anesthetic, and is as simple as the routine shots your pet receives. The microchip is injected between the shoulder blades, beneath the skin’s surface. The process only takes a few seconds, so you'll be in and out of the vet before you know it! 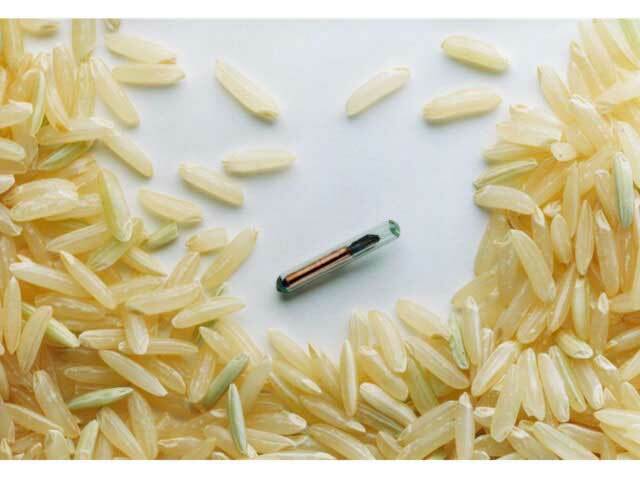 The microchip with rice for size comparison. Even if your pet wears a collar with tags, a microchip is the only permanent form of identification that won't be able to fall off, be removed, or become illegible. Microchips are designed to work for 25 years, lasting throughout your pet's lifetime. Dog being scanned for microchip. As microchips are becoming more popular, companies like SureFlap have created some really neat technology such as a pet door that can recognize your pet's chip to let him in and out of the house. The door can be programmed to lock and unlock at certain times, and although any pet can exit through it, only the microchipped pet can get back in. This prevents unwanted intruders like raccoons from entering your home. According to the Humane Society, one out of every three pets is lost during their lifetime. This leads to an overwhelming amount of strays, shelter dogs, and unhappy families. Most pet owners should want to do everything possible to prevent losing their furbaby forever, and microchipping is a simple, modern day tool that can increase the chances in reuniting an owner with their lost pet. You won't regret microchipping your pet, but you'll always regret that you didn't if your pet gets lost. It's important to remember that a microchip is NOT a GPS able to track your pet, but instead a permanent form of identification. If your pet gets lost and is brought to a shelter or veterinarian, they will scan for the chip and read its unique ID code. It's with that code that your contact information can be retrieved from the lost pet database, leading to a reunion with your pet. Microchipping your pet is easy, affordable, and your best chance of reuniting with a lost pet. If you want to learn more about microchips there is an abundance of resources on the web and definitely be sure to ask your vet at your pet's next check-up!